Born at Bolton, Quebec in May 1866, son of Nelson C. and Azelia Kneeland. When he was a young boy, the family moved to a farm in southern Minnesota. He began business as a grain agent for the Brooks Elevator Company in North Dakota. After six years the company sold out to the Duluth Elevator Company, a subsidiary of F. H. Peavey and Company. He became traveling superintendent and then general manager of the Duluth company. 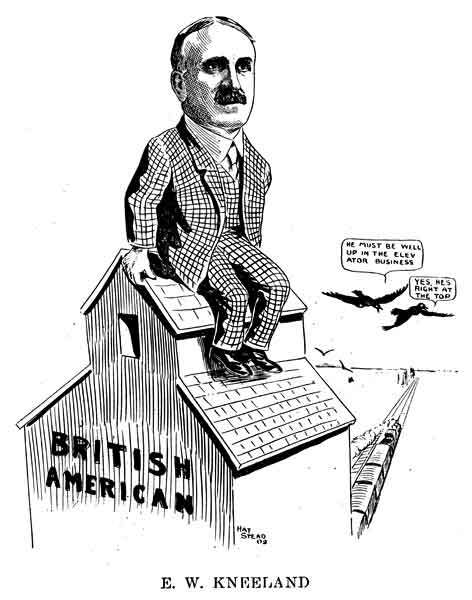 In 1906 he was sent to Winnipeg to organize the British America Elevator Company. He joined the Winnipeg Grain Exchange at this time and served as its President (1927-1928). He helped to develop the Security Elevator Company, Port Arthur Terminal Company, National Elevator Company, Saskatchewan Elevator Company, and Home Grain Company. By the time of his death, he was President of the Dominion Malting Company, founder and President of the Kneeland Grain Company, President and director of the Carrott River Colonization Company and Picardy Candy Limited, Vice-President and director of the National Elevator Company, Pacific Terminal Elevators Limited, Canadian General Securities Limited, Canadian General Investments Limited, Traders Finance Corporation, Canadian Insurance Shares Limited; director of City Dairy Limited, Manitoba Sugar Company, British American Elevator Company, and C. S. Gunn and Company; and Chairman of the regional board of the London and Western Trusts Limited, Traders Building Association Limited, North American life Assurance Company, D. E. Stewart and Company, Third Canadian General Investment Trust Limited, and London and Western Trusts. In 1893, he married Minnie Honstain of North Dakota. They had one daughter, Sybil Azelia Kneeland. He was a member of the Manitoba Club, St. Charles Country Club, Pine Ridge Golf Club, Kenora Golf Club, and the AF & AM. He enjoyed sailing and served as vice-commodore of the Royal Lake of the Woods Yacht Club. In 1935 he became a member of the Manitoba council of the St. John Ambulance Association. The following year he became President, replacing W. H. Carter, which position he held to his death. In 1939 he was invested with the Order of Commander of St. John by Lord Tweedsmuir at Ottawa. He was a member of the board of governors of the Lakeside camps for under-privileged children. He was made an honorary colonel of the Winnipeg Grenadiers in 1940. He died at Montreal, Quebec on 21 May 1941 and was buried in St. John’s Cemetery in Winnipeg. Minute Book No. 1 (1921-1943), 23 December 1941, page 198, The Winnipeg Foundation.